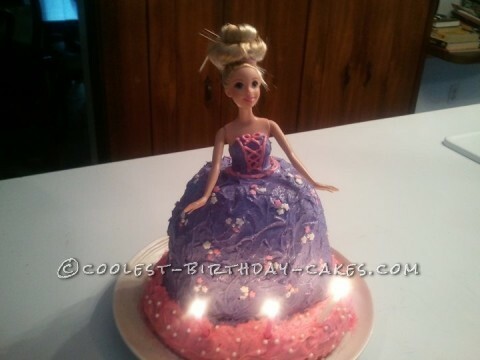 I made this doll cake for my daughter’s 3rd birthday. I made the skirt with a pampered chef round bowl rather than buy one of those expensive skirt pans. Vanilla cake mix, homemade vanilla butter cream. Also made a small round cake to put under the domed cake. I didn’t want to set poor Rapunzel aflame and traumatize my daughter. I carved out a space to put doll in so that she fitted right and filled in around her with icing, then decorated. Unfortunately had to keep her hair up..lest it get in the icing.